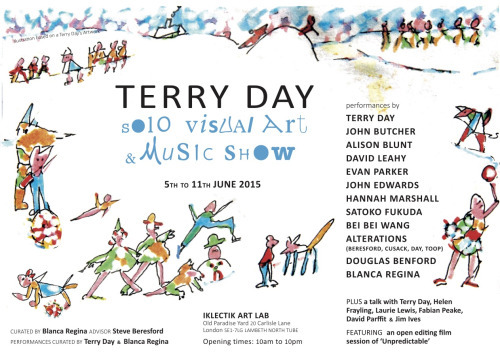 Terry Day solo visual art and music show’ featured previously unseen artwork by the musician and artist Terry Day, including paintings, miniatures, and more. It also presents performances every day, a talk, and extracts of the film ‘Unpredictable’. TERRY DAY is an improviser, multi-instrumentalist, lyricist, songwriter, visual artist and poet: a first generation pioneer improviser from the 1960s. He formed a duo with Derek Bailey in the late ‘60s and was a regular member of The Continuous Music Ensemble, People Band and, later on, Alterations with Toop, Beresford & Pete Cusack. Since then he has collaborated with numerous artists. Speakers: David Parfitt, Laurie Lewis, Helen Frayling and Terry Day. 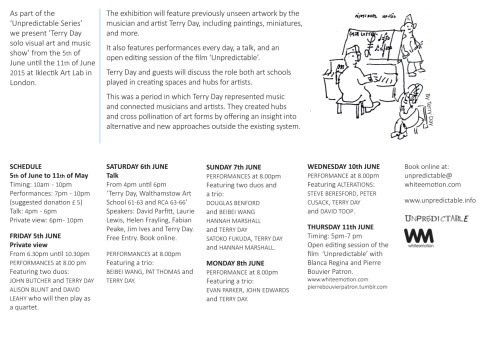 Terry Day and guests will discuss the role both art schools played in creating spaces and hubs for artists.This was a period in which Terry Day represented music and connected musicians and artists. They created hubs and cross pollination of art forms by offering an insight into alternative and new approaches outside the existing system. DAVID PARFITT lives and works beside the Thames in West London. Here he paints portraits, and also the tidal Thames with its bridges and tower blocks, the towpath and the foreshore.He studied painting and drawing at Newport College of Art 1959 – 1963 and at the Royal College of Art 1963 – 1966. He has taught in many art schools, including the Royal Academy. He exhibits regularly in NEAC Members exhibitions at the Mall Galleries, The Mall, London SW1. HELEN FRAYLING studied Fashion and Fine Art at Walthamstow in the late 1950s and early 1960s, when she was Helen Goodrich, followed by Painting at the Royal Academy Schools. After ten years teaching in various Art Colleges, she was awarded an MA at the RCA in 1979, with a thesis on the increasng importance of craftsmanship. Since then, she has combined teaching in England with exhibiting her paintings in the West of Ireland. In 2000, she became Lady Frayling.